My Frankenstein review was a bit premature - I found the rest of the line the next day. That includes the Werewolf, Voodoo Queen, Mummy, Dracula, and Sea Creature. I've seen them at lots of specialty shops - Electronics Boutique, Game Stop, Software Etc. and even Hot Topic, though they were $16 there so you definitely want to steer clear of them. EB had the best price so far at $11.99, but I'm assuming stores like Toys R Us will have them for under ten bucks. This clam shell packaging is growing on me. It works well, you can see the figure and insert easily, and it holds up to shelf wear like nobody's business. 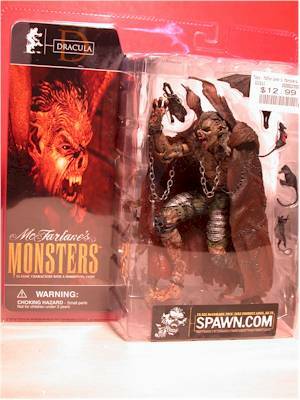 The sculpting on this line has the usual detail and intricacy that you've come to expect from McFarlane. It is their strongest suit, and something that sets their figures above others. This line is no different. 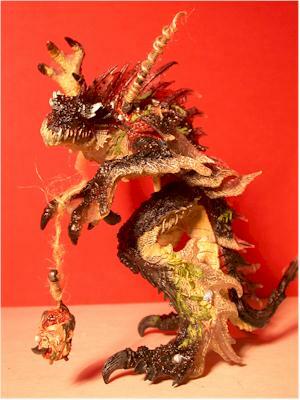 While some of the designs may not be to your liking, they are all well sculpted. The least exciting is the Werewolf, and you can expect him to be the peg warmer. I'm not sure about the soft 'membrane' that covers his face in the packaging, but you'll want to get it out of the way as soon as you open him up. The face is much better underneath, but overall he's just not a great figure. Dracula is better, particularly the face sculpt. There's tons of detail here, with a style that most folks will at least find passable. 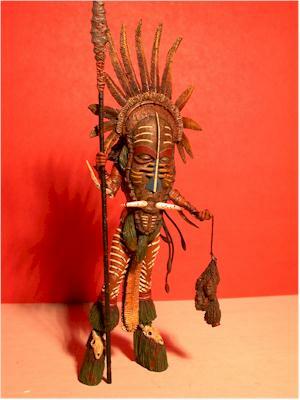 The Voodoo Queen is very well done, with tons of detail and a great style. But the two winners are the Sea Creature and the Mummy. The level of detail in these sculpts really is amazing, and you won't be disappointed with either one. The Sea Creature sculpt is one of the best of the line, and would have been the top scorer except for one detail that I don't like - the position of the head. Posing him with the twist in his head, as though he's looking back over his shoulder, really hurts the number of poses you can put this figure in. There's a couple interesting points on the Mummy sculpt. First, the hole in his face actually passes all the way through to the back of his skull. 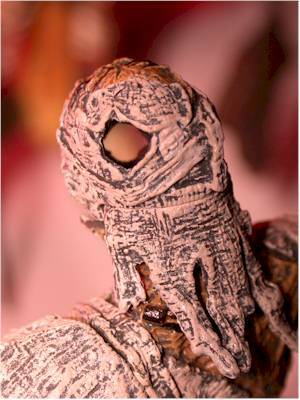 And second, the details are so good on this figure, that there is even a small scorpion trapped under the bandages of his left leg. The paint ops on most of these figures is extremely good, with Sea Creature being the top standout, but the Voodoo Queen a close second. I picked up the bloody versions, so everyone has some level of blood splashed around. Well, except for the Sea Creature. I thought that the blood on his hands and claws actually detracted from the look of the figure, so I went with the clean version there. The weakest in this category is a surprise - the Mummy. While he's the best in most of the other categories, here he's on the sloppy side. The paint work on the medallion and other items of his body isn't as clean as you'd expect, and it detracts from an otherwise perfect figure. The paint work on the gold head piece is great though, so I'm not sure what went wrong. 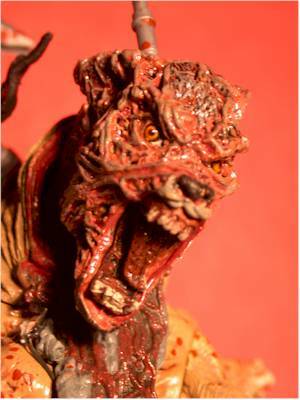 All the figures, with the exception of the Werewolf, have great accessories. 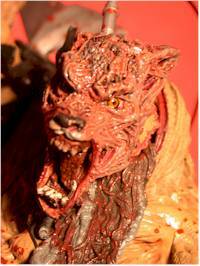 Perhaps the 'backpack' on the Werewolf is intended as his accessory, but compared to the other figures it is lacking. Dracula comes with a ton of rats, another bat or two, and since his cape is removable, I'll count that as well. 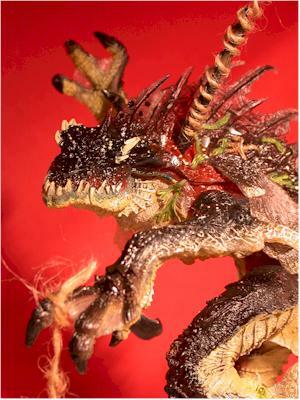 His cape is also made from a translucent plastic, with a metal chain across the front. 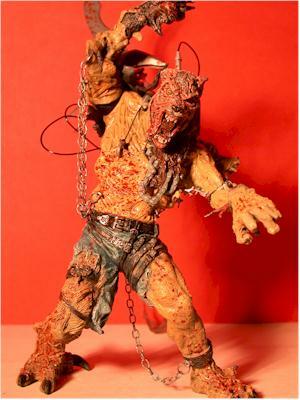 He also has a number of metal chains hanging off him with bats attached. The sculpts on some of the rats is weak, but overall they make for great accessories. The Sea Creature has two spears, one that is broken but fits nicely into a small hole in his upper back, obviously the reason he's looking over that shoulder. There is also a man's head on a hook, most likely the gent that speared him in the back. It's appropriately gruesome, with one eyeball hanging out. That had to hurt. The Voodoo Queen has an excellent spear as well, and this one has an extra nice touch. There is a metal pin, rather than plastic, that holds the two pieces together. It's sure to hold up much better. 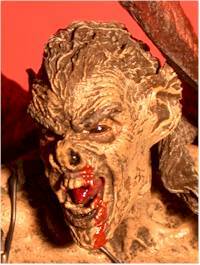 She also has the ceremonial mask, sculpted with lots of attention and detail, and it fits perfectly over her head. 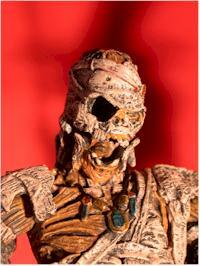 The Mummy has three major accessories. First, there is the golden dog faced cowl, intricately sculpted and nicely painted. It fits tightly, but won't fall off. There is also a bendy cobra, looking ready to strike. And finally, he has a two ended weapon, which can be connected to make one lethal tool, or two separate but just as deadly weapons. These can also be attached to the back of the cowl. 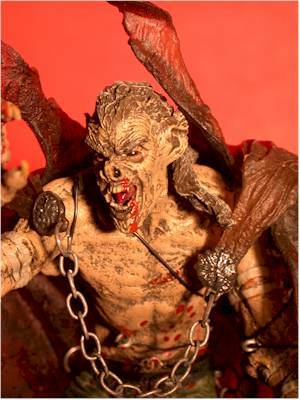 The Werewolf is the least articulated of the set, with shoulders (one ball jointed), neck, waist, left wrist, and hips. The blades on his backpack also have some limited range of motion. He stands well on his own, but compared to the others is a bit lacking. 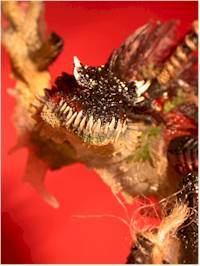 The Sea Creature is better articulated than you might first assume. With neck, ball jointed shoulders and hips, a bendy tail, and mid-waist joint, he can handle a lot of poses. It's just the sculpt of the head that restricts some of the things you can do. He stands just fine on his own. Dracula has fairly decent articulation as well, with neck, shoulders, cut joint bicep on the right arm, wrist on the left arm, waist, hips, and cut joints at the calves. He has rather funky feet though that make standing him a little tricky. 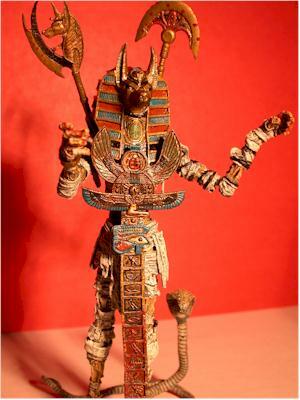 The Voodoo Queen has neck, shoulders, wrists, a cut joint on the right bicep, chest, hips and cut joints on the calves. She stands nicely on her own. It's really surprising just how many hidden joints there are overall. But the big surprise is the Mummy. With neck, jaw, ball jointed shoulders, ball jointed hips, waist, REAL elbow joints, REAL knee joints, REAL wrist joints, REAL ankle joints (not just cut joints! 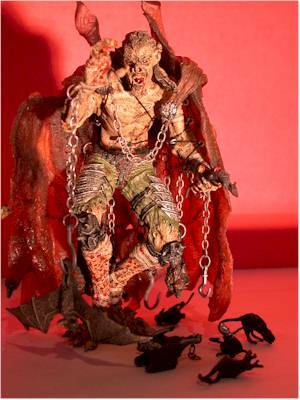 ), cut joints on the thighs, and cut joints on the upper arms, he's one of the best articulated McFarlane figures ever. All the joints are well hidden, and have good mobility except for the hips. At $12 or #13, these are an okay buy, but I'm hoping that this increase isn't something we'll see for all Spawn lines. These really shouldn't be more than $10 a pop. Coming up with overall scores on a couple of these was tough for me. 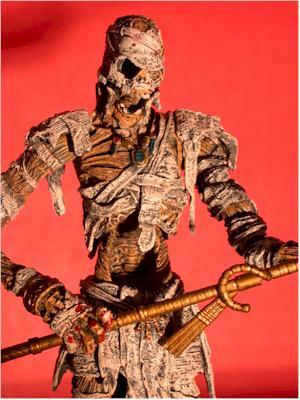 I had no trouble giving four stars to the Mummy - he is in contention for best figure of 2002. 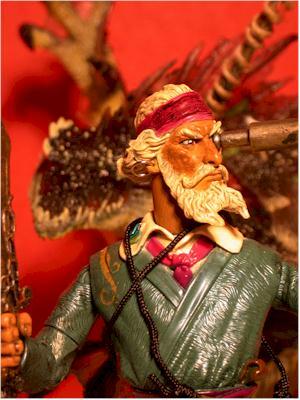 Likewise, the Sea Creature is an excellent figure, only hurt slightly by the pre-posing of his head. 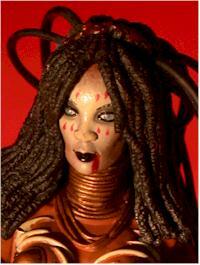 Voodoo Queen is well done, but is really here just to be the required babelicious figure in the series. Dracula and Werewolf aren't terrible figures, but stacked up against the rest of the line they certainly don't deserve higher marks. If you're looking to decide which figures to buy first in this series, I recommend the following order - Mummy, Sea Creature, Frankenstein, Voodoo Queen, Dracula and then Werewolf. I may even pick up the Alien Spawn from the last series to go along with them.